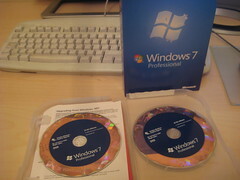 Yay, my copy of Windows 7 dodged the UK postal strikes and made it to my desk. I’m now eagre to get the install under way. There is no option to upgrade from XP so I’m going to have to do a complete Windows reinstall, which is fine by me as my PC needs a clean up. And since moving my development environment to a Virtual Machine, a reinstall of my host OS is far less of a deal these days. I also keep my media and docs on a separate drive these days which again makes clearing C:\ a far less daunting task. However there are a few things that need to be backed up before I blow XP away! What should I backup before upgrading to Windows 7? Here is my list, it might give you a few ideas, but obviously your list could be different so make sure you have a good root around your harddisk. My Documents – currently not kept on the system drive, but worth checking the security on the folder. If you have made this “private” then regaining access to it later will be harder. If you do hit this problem then the following KB will help. If I think of anything else before the install, or if I found I’ve missed something after the install – yikes – I’ll add it! Got a few mins before the above backups finish running, then it’s time to wipe C:!